Okay – I probably shouldn’t even be telling you about this website I’ve been frequenting for the past 6-8 months. It’s really addicting. 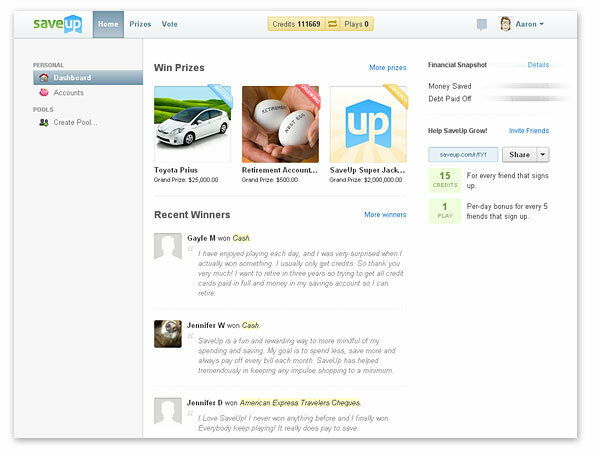 It’s called SaveUp – and you can play for prizes with credits that you earn for saving money or paying off debt. They even have a “Powerball-like” drawing for 2 million dollars every month! I know – “what? !” Best thing is – it’s all free! SaveUp’s whole goal is to get people saving money again and out-of-debt. They do this by providing its users with “incentives”. The more you save and pay off your debts – the more incentives you win (credits that can go towards prizes and free plays). It’s really quite simple and fun. When you sign-up for a free account and log-in, this is what you’ll see at your “dashboard”. They’ve definitely done their homework when it comes to user interface design and developing easy navigation. At the top of the navigation bar, you’ll see there are three menu items. Home – which this picture was taken; Prizes – where you will go to when you want to spend your credits (there must be about 20-30 different prizes you can play for right now, including a trip to Florida as well as $50,000 to start your own business). And then a Vote page where SaveUp gives users the opportunity to select which new prize will be available in a “monthly drawing” (like iPads, cash, Kindles). By default, a user is given 3 plays a day. If you don’t use ’em – you lose ’em. It’s a good idea they only give you that many a day. I can see many folks losing their jobs and wasting a lot of time playing the games! If you have an excess of credits, you will have the opportunity to gain more daily plays – but I think there is a limit on those too (again, for good reason). Where’s the “catch” in all this? I was asking the same thing when I signed up with SaveUp too. Why is this all free and how do they make their money? Well, they do make money – but not off of you giving them any of it. :) Sometimes SaveUp will offer or suggest a financial institution to sign-up with – like a high-yielding savings account. If you get an account through their recommendation – SaveUp gets a nominal referral fee. They also partner up with businesses to offer the cool prizes – and so they’re making money through these sponsorships. All you have to do is show up and play. Just a side note. I have won once playing for the prizes. It wasn’t a big prize – but it sure was fun to see my cards line up (you’ll know what I mean by cards when you play some of the games). Many of the prizes they offer – have a long “shelf-life” – meaning – the prize may be going on ALL year. Check out their rules page for more info on the prizes and the odds of winning. I think the draw of seeing if you can win a big ticket prize PLUS seeing the sidebar of money being saved and debt paid off – is a rewarding feeling and worth the daily visit. SaveUp is teaming with us to give TTG readers 100 free credits if you sign-up through the link below. There is a nominal benefit to us if you sign-up and add a financial account. But our real aim in supporting SaveUp and offering this link to you is that we hope it’s another tool in your toolbox to help you to save more and get rid of that debt. We’d love to hear what you think about it – and if you win anything. Should you win the 2 million dollars – we don’t wanna hear about it. :) Have fun – and save up! Update 8/7/14: Sometimes people ask, “has anyone won any cash / prizes from SaveUp?” Personally, I have won over $200 since joining them in 2011 – so it can be done. Lively HSA Review – Is an HSA Right For You? Helped start Three Thrifty Guys with his friends Charlie and Mark after being inspired by how they lived their lives “on the thrift”. A designer by day, Aaron was once $40k in debt. After 5 years – he dug himself out and lives to tell about it. Aaron has also blogged at the StarTribune. Sounds like a great concept for a website. I’m sure they’ll do quite well with that business plan. I would check it out, but I have a rather addictive personality and am a sucker for computer games. So I’m gonna have to use my willpower and stay away for now. If I have more time though, I’ll be sure to check it out. Haha.. I hear you MM. Good thing you only get a few plays each day.